Alex J. Cavanaugh: Not one but TWO flying cars! Not one but TWO flying cars! 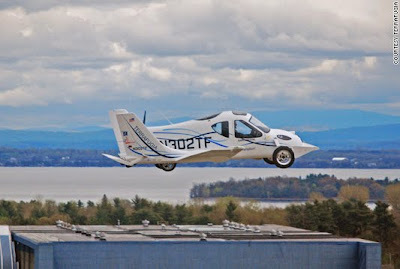 This is the Transition Roadable Aircraft by Terrafugia. It received certification as a Light Sport Aircraft and will begin production soon. The plane will cost almost $200,000 and requires 20 hours of flight certification. Its function is a plane, but once on the ground, the wings fold up and it can be driven like a car. So basically, after you land, you just fold up and drive home! I want one. Think it comes with photon torpedoes? 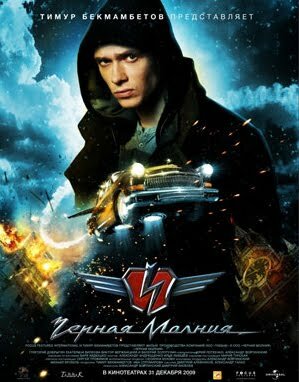 I’d like to see the Russian version!! Thanks Dude – this is awesome!! Hard to follow the subtitles, but it looks like a great flick! Our roads are enough of a moron-magnet; I hope "Sport Flight" stays tightlt regulated! Wow. The movie looks like a good one. The subs helped. I would love to fly a Car. Before that, I need to learn to drive a Car! Congrats on the award and also an excellent post. Hi Alex, thanks for the visit, Yes I really did go through hell living at N. Ireland, I even had police cameras inside the house trying to catch the culprits.In the end I sold up and went to Spain close to my youngest son then came back to the UK.But that's life I guess put it down to experienece of life. OH! I really want a car I can fold up! Yes! Dude, they promised us flying cars years ago! And that movie looks freaking awesome, thanks for sharing Alex. you know, people have a hard enough time driving in just two dementions. Now this is an award I definately appreciate. This is one of a kind. Thanks, and have a great holiday weekend. Hey, Jamie - you were first on my list! Wow, I won? I'll send you an email, Hart. Yvonne, that just sounds terrible! Budd, I can only imagine the mess when more people take to the sky. Timur Bekmambetov is getting really popular among the sf geeks, almost every other upcoming dark or sf movie project has him mentioned behind the helm. 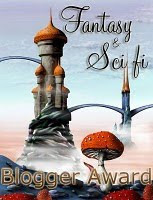 Congrats on the Fantasy and SciFi blogger award, it looks really beautiful! Well deserved. I'm gonna wait for the one that flies itself. A plane/car would be mighty handy. If too many of them hit the sky/road, they'll have to be regulated or something, though. I'm dating myself, but the first flying car reminds me of the cartoon: "The Jetsons," and how whenever I watched it I felt sure we'd have flying cars some day. Someday has arrived. Thank you for the award! We'll beam it aboard soon. The Jetsons car is great. Ejecting the kids out of it in their own little pod instead of sitting in a carpool line-- now that'll be cool. Dezz, I'll place an order for you. Bryan, you are welcome. And jettisoning the kids is a great idea! I saw a television report about one of those flying cars a couple days ago. Sounds kind of cool, but it also sounds very dangerous if many people have them. Would they be regulated by the FAA and operators have to file flight plans? I can picture all sorts of weird accidents and flying cars crashing into houses and buildings. I don't know if this idea is going to fly. I need to start saving for that flying car now. I really want one! PS Alex, you can modify the size of the embedded YouTube videos which you post in your blog so that they fit the width of your post by changing the size numbers in the embedding HTML code that you copied here from YouTube :) You can put for example width="425" height="325"
Flying CAR!!! 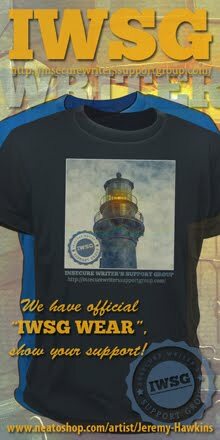 I totally want one! Not that I like flying all that much. Or driving. But it would still be wicked awesome to own a flying car. Arlee, it still has to pass all the tests of an aircraft. Thanks, Dezz - I'll get that fixed. re: Black Lightning - - like the "Transformers meets Batman" woaaa.... does that mean everything will fly by so fast that we can't hear Christian Baile's growl? That is a way cool car! Of course James Bond drove the prototype years ago! And $200 grand puts it just a little out of my budget! Great sounding flick and kudos on yet another deserved award! Only $200,000?! I am going to start saving my teacher salary right away! Anything that flys, I'm there. It sounds like something out of an Eve Dallas story by J.D. Robb. Congratulations on the cool award. Well deserved. Rogue - ha! Guess we'll find out. Karen, anything to keep from driving - I'm all in favor! That flying car is too cool!! Played a little Guitar Hero yesterday with my kids and thought for a second of you - only becuz I figured you'd think I was a total nerd. Happy 4th!!! I read about car/plane thing as well, then I saw it with the wings folded up. My question: How do you drive it with no rear view mirrors? I agree with Will its hard to follow the subtitles but other than that it looks awesome. I have to see if after school I have a chance of working on the english version. A flying car? Thats awesome! Definatly need myself one of those.